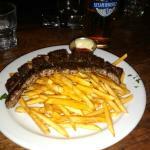 Went to Jule's with friend for dinner. Great food and superb service. The grilled octopus, goat cheese salad & French onion soup were very tasty. David an exceĺlent host. We had reservation for 630 and seated promptly. Also greeted by the owner with a friendly smile. 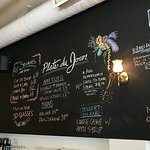 Great wine list and food menu. We were able to experience the 3 course meal. Everything was great. Service excellent. Open kitchen so you can see how your meal is prepared. Beautiful bar and atmosphere. Would go again next time in Toronto. 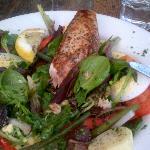 This is a hip hopping bistro - simple but yet excellently prepared foods. 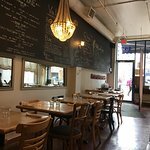 Located near Queen St, we have been going here for 20+ years and it never disappoints with its food, service or ambience - we go for all of it. I love the Salade Nicoise even though my first choice at most places is "meat" - it is even better than what I have had in France - must be the well balanced dressing and freshness The platters for two (beef, cornish hen ...) are spectacular. 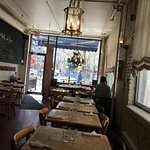 The decor/servers are very much in tune with the Queen-Spadina hipness and promotes liveliness and so a great place for first dates. Excellent value. Don't forget about the desserts - my kids have grown up on the best chocolate mousse whereas I love the blueberry tart. 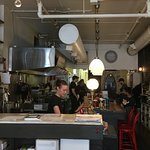 I have not been to the other Jules restaurants (recent) in town yet, just the Spadina one. 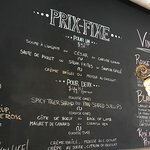 I met two friends here for dinner, my first time at Jules Bistro. Our waitperson was very attentive and helpful. 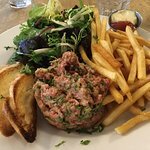 I ordered the quiche (leek and caramelized onion) which was served with frties and salad, My friends both had the steak frites. We all enjoyed our food. The quiche was very flavourful. 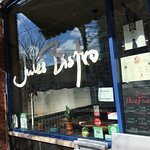 Been to Jules Bistro? Share your experiences!